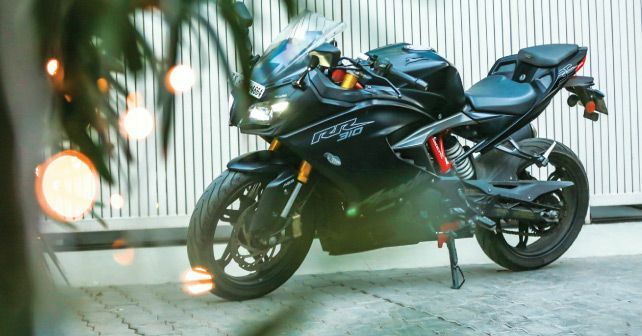 It took some time for my grand scheme of things to fall into place, but when Shivank was busy travelling on assignments, I finally got my hands on the Apache RR 310. Straight away, the touring riding stance came to my rescue at slow start-stop traffic as I wasn’t forced to sit aggressively and at ease, I could negotiate the traffic. The other thing that has always stood out for me is the set-up of the rear monoshock as it continued to carpet most of the ditches that I came across. As great as the RR 310 is to ride, I faced some annoying engine stalling issues, which occurred so often that I ended up creating a bit of traffic jam. Before I go on ranting, the good news is that the RR 310 is going for a much-needed service. The other thing that needs to be checked is the loose chain. We are hoping it's nothing serious and it’s all due to lack of lubrication. Coming to the brakes, the front 300mm disc brake is still one of the most responsive in the business, but the same can’t be said for the rear 240mm disc brake. It’s quite spongy and when the push comes to shove, or when applied in an emergency, you can feel the brakes fading. I guess it's another thing to add to our service check-list. All-in-all, these are just regular niggles and I can’t wait to ride the RR 310 again once it's back from the service station.